Round two of the season's SST races has Justin Lofton dominating the SST Grad Prix in Long Beach as racers vied on an asphalt course for the first time. Despite a practice mishap on Saturday, Justin Lofton was able to come back during the Long Beach run of the Stadium SUPER Trucks Grand Prix and take the podium. With near-perfect weather, the races kicked off with a surprising twist: they were on the temporary asphalt of the Toyota Grand Prix of Long Beach rather than in the dirt. This interesting twist changed the race metrics considerably versus the first race in Phoenix. Weekend practice runs proved that the asphalt was challenging to the offroad-ready trucks and drivers used to skidding through sand rather than over pavement. Sunday's qualification rounds found Justin Lofton taking the speed lead with a full two seconds to spare in what was to foretell things to come on race day. The race itself saw competitors scrambling as spinouts and missed landings took their toll. Lead positions changed regularly throughout the course, though contenders Lofton, Robby Gordon and Rob MacCachren (winner of last week's race) were always in the scramble. Things changed quickly in lap two when Justin Matney spun out, facing the wrong way on the track, causing the rest of the pack to break up in avoidance maneuvers. The next lap saw early leader Greg Adler drop out of the race with transmission issues, giving a restart on lap four that proved crucial for Lofton i taking the lead. Final results were Justin Lofton in SPEED Energy #2, Robby Gordon and points leader for third Rob MacCachren. 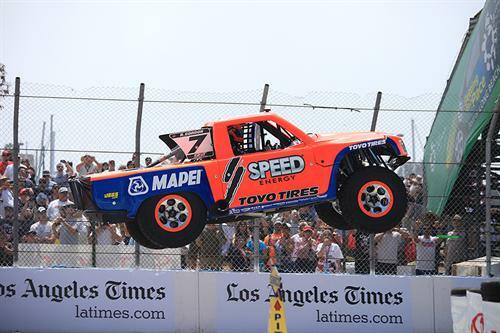 The Stadium SUPER Trucks season continues on Saturday night in Los Angeles at the Coliseum with a full slate of racing in several categories, including SUPER Trucks, Monster Trucks, SUPER Buggy, and SUPER Trophy Kart. Races are televised on NBC Sports live locally and rebroadcast nationally the day following. The next two races, happening in May, will take place in San Diego before moving to Missouri, Illinois and other points east.